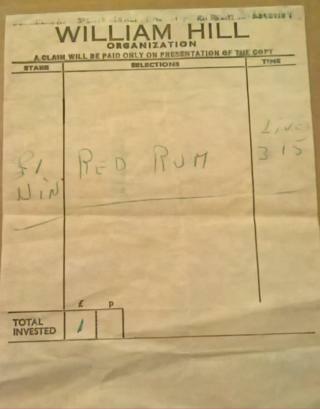 A family have cashed in a bet on Red Rum winning the Grand National 43 years ago - after discovering an unclaimed betting slip. Bob Holmes found evidence of the £1 bet while going through his late father-in-law's paperwork. Through a shop code, William Hill found that the bet had been placed at odds of 11-1, meaning a payout of £12. But the firm decided to add inflation, making it £130. They also gave out £130 in bets and donated £130 to Water Aid. 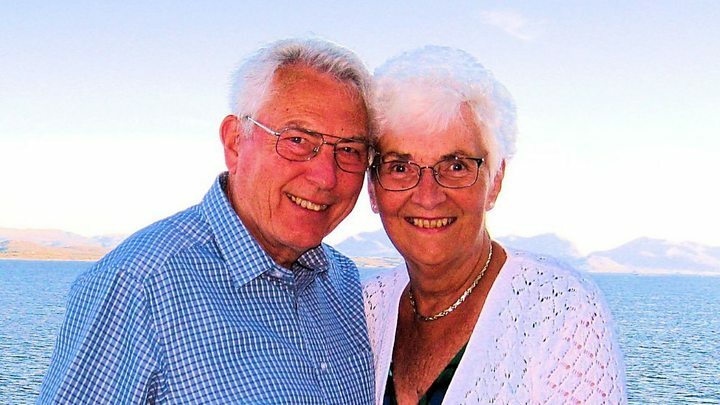 Bob Holmes, 76, his wife Nancy, 75, and Nancy's sister, Rhoda Robertson, 79, all from Houston in Renfrewshire, are sharing the winnings and have each placed bets on Saturday's Grand National. The £1 bet had been placed on the 1974 Grand National by Mr Holmes father-in-law Joe Robertson, who died in 1979 at the aged of 82. Mr Holmes told the BBC Scotland news website: "Twelve pounds would have been a lot of money in those days. He must've turned the house upside down looking for it." He said Ms Robertson had been planning to throw all her father's old paperwork out. "But I'm quite a curious person so started looking through it and saw the betting slip with Red Rum on it," he said. "I thought I could keep it as a curiosity but thought it might be worth letting William Hill know. "I was very surprised when they said they would pay out and delighted when they said they would inflation-proof it." William Hill spokesman Graham Sharpe told the BBC news website: "Everyone has heard of Red Rum so it's difficult to understand how he didn't collect his winnings. "I've been with the company for 45 years and we always go out of our way to settle any late claims - but the previous record was seven years. "We ascertained that the code referred to a shop that is no longer a betting shop but proved it was genuine. It seemed a bit churlish to just pay out £12 so we agreed to add inflation which made it £130. "We also donated £130 to Bob's chosen charity Water Aid and gave out an additional £130 worth of bets for this year's Grand National to see if the family luck would maintain itself over 43 years." In homage to Red Rum, Mrs Holmes has put a £25 each way bet on favourite Definitly Red, in Saturday's Grand National, while Mr Holmes has put a £20 each way bet on Blaklion. Ms Robertson has put a £20 each way bet on Ucello Conti.